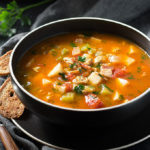 This perfectly hearty and easy Manhattan Clam Chowder recipe uses celery root instead of potatoes to keep it flavorful and low carb. Keep yourself warm this season with this fabulous gourmet soup. My favorite time of the year has arrived, Fall. Those of us living in southern California are enjoying crisp-cool morning temperatures and warm sunny afternoons. It’s finally time to bring out the sweaters and enjoy a warming bowl of soup for lunch or dinner. Of course, I eat soup year-round. My family loves soup and I not only find it easy to make, but it’s great to have on hand for those days when you just don’t feel like cooking anything. Since going low carb, I have had to find ways to lower the carbs of my favorites like Minestrone or cream of celery soup. Manhattan clam chowder is the newest on the low carb soup list and it’s delicious. BTW, if you are wondering about the croutons and potatoes in the photos…. they are low carb subs (Sukrin Sesame Bread Mix and celery root), that fooled even me! There’s much controversy surrounding Manhattan clam chowder; people either love it or hate it. I personally love it. Those who don’t care for it often prefer New England style clam chowder, which is a cream soup consisting of clams, milk and potatoes. As I previously said, I love Manhattan clam chowder because it’s nice tomatoey broth tickles my Italian heritage and it’s ease of preparation makes it perfect for weeknight dinner-time. Although I say it’s tomato based broth appeals to the 2-drops of Italian in me, I did some sleuthing and discovered that this shellfish soup was most likely developed by Portuguese immigrants who were already preparing tomato based fish stew at home. Portuguese fish stew anyone? 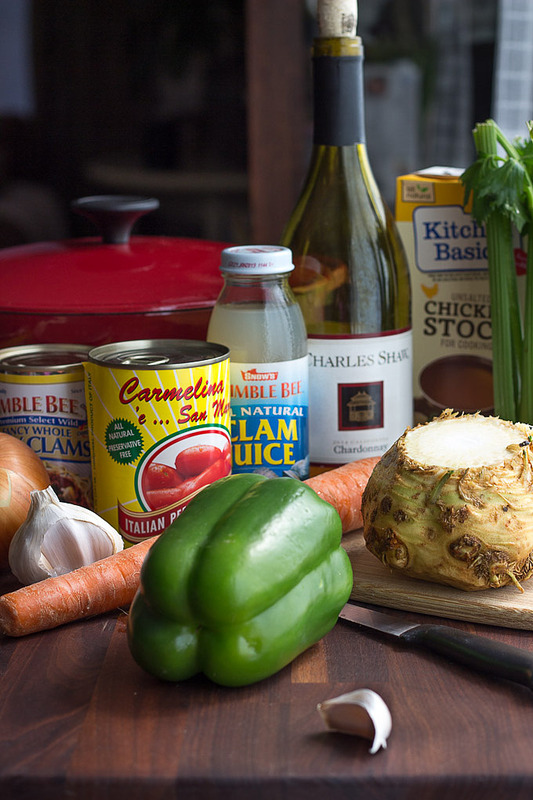 Traditionally made with potatoes, celery and onions, this easy version for Manhattan clam chowder uses celery root (celeriac) for both it’s celery flavor and it’s texture – which is similar to that of potatoes. A little green bell pepper brings in a tiny sharpness similar to that found in Louisiana cuisine, in which the Portuguese have also had a hand. This is evidenced by the use of green bell peppers instead of carrots (usually found in a traditional French mirepoix of onions, carrots and celery) and the addition of tomatoes to some of the soups and stews of the region. 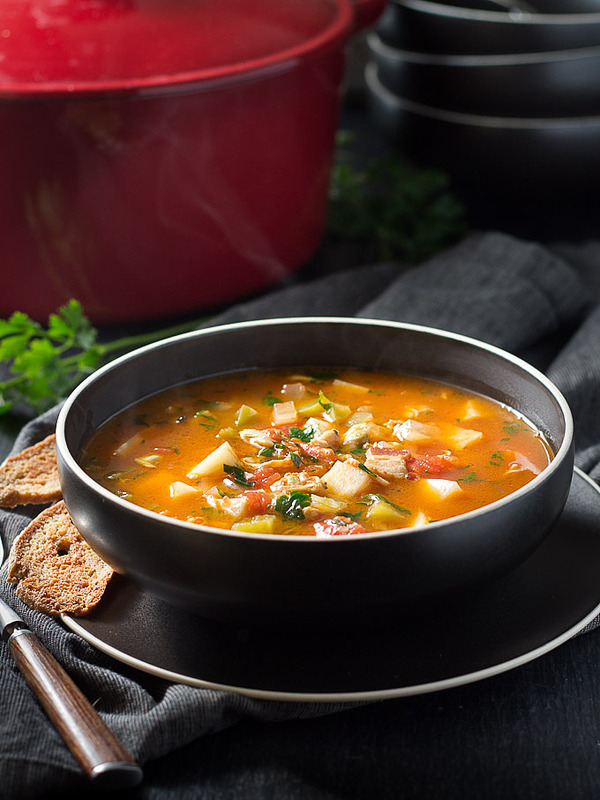 This easy Manhattan clam chowder recipe is low carb version allowing a hearty portion size. This chowder recipe from the New York Times was my inspiration. Be sure to select canned clams without any added sugar such as Bumble Bee Brand. I used canned clams for convenience and to bring the dish together quickly and simply. Bacon adds a nice depth of flavor, smokiness and mouth-feel and the addition of butter at the end makes it better. 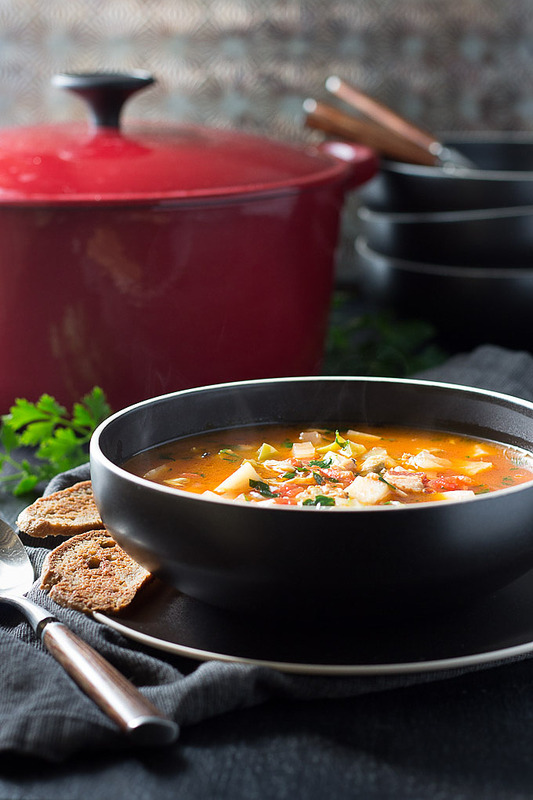 This is an easy soup, perfect for weeknight cooking and yields 8 hearty 1 ½ cup portions (355 ml). 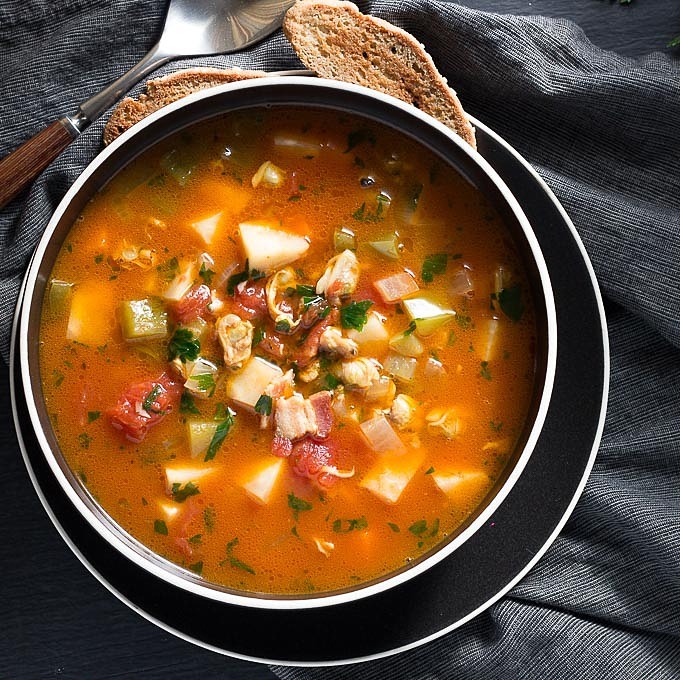 Each hearty portion of this delicious Manhattan Clam Chowder is 8 net carbs. Peel the celery root with a sharp chef's knife and cut into 1/2-3/4 inch dice. Dice the bacon. Heat a 5 quart dutch over or soup pot oven medium heat. When hot, add just a touch of oil to the pot and then the bacon. Let the bacon cook until crispy, stirring occasionally, for about 5-6 minutes. Meanwhile chop the rest of the vegetables and open the cans. Turn the heat down to medium low and add the onion, garlic, green bell pepper, carrot and celery root, stirring to coat in the bacon grease. Pour in the wine and cover with a lid, letting the vegetables sweat for 2-3 minutes, stirring once or twice. Stir in the thyme, bay leaves and tomato paste. Add the plum tomatoes and their liquid to the pot, either crushing with your hands or cutting them with kitchen shears right in the pot. Add the chicken broth and clam juice. Turn the heat to medium high and bring the chowder just up to a boil and then turn the heat back down to medium or medium-low so the chowder can simmer for 15 minutes. Add the clams and heat through. Add the butter and stir until it has melted. Add salt to taste and lots of pepper to bring out the savory flavor of the soup. Stir in the parsley and serve. Each 1 1/2 cup (355 ml) portion is 8 net carbs. I was wondering what you think about using Jicama instead of celery root? This looks delish! I am trying it tonight. Excited! Thank you! Perfect soup for those cold nights coming. Looks great. Kim, what beautiful photos! This soup looks and sounds just amazing. I love how you have replaced the potatoes with celery root, which has such a nice earthy flavour. This looks so delicious and warming! This looks beautiful! My family loves clam chowder and I have actually never made it before. This looks so good I could lick the screen. Seriously. I’m sitting here in the typical dreary Pacific Northwest with the heater blasting and could really go for a warm bowl of chowder right now. My grandpa always served clam chowder at his restaurant when the weather took a dive and it was always my favorite thing on the menu. Pinning for later this week, I need some comfort food! Awwww, thanks Janet. How kind of you to say. Wow, so great to hear that this working girl is still working. Good for you. Thanks again for the lovely comments. Have a wonderful week – Kim.